Not satisfied with your job? here’s how you can quit. Technology-centric job matching site, itzbig-where candidates find jobs by matching their profile with job requirements, will now tell an easy way to get yourself fired from your job. 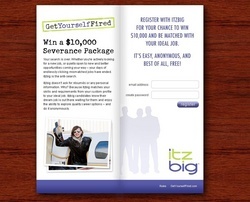 Itzbig has launched “Get Yourself Fired” , a move to create a viral marketing campaign around your job-termination, after which you may run back to itzbig for a better job (or for a better salary, if you will). An easy way to leave that “not really perfect one”. At the site, you superimpose your face on a variety of compromising images to then e-mail them to your friends (or boss) and therby, you make good bonding with your colleagues (or outrage those who have not been good to you, specially your boss). You can also peruse some humorous work-stress tips and enter for a chance to win a $10,000 sweepstakes by entering a profile on itzbig. Itzbigâ€™s partner for the campaign is Third Rail Creative, an award-winning creative advertising and design agency, which has co-working experience with Charles Schwab, Chick-fil-A, Continental Airlines, Honeywell, and The Home Depot, among others. Overall, this is pretty commendable idea. Actuall, itzbig has created brialliant initiative for their business generation and brand building. Kudos to them.